Ordinary Chinese style fried rice will never be quite good enough for you after you try some of our Thai fried rices. This green curry fried rice has all the flavor of a rich and creamy green chicken curry soup, but served up with the rice already in it for a delicious plate lunch or side dish. 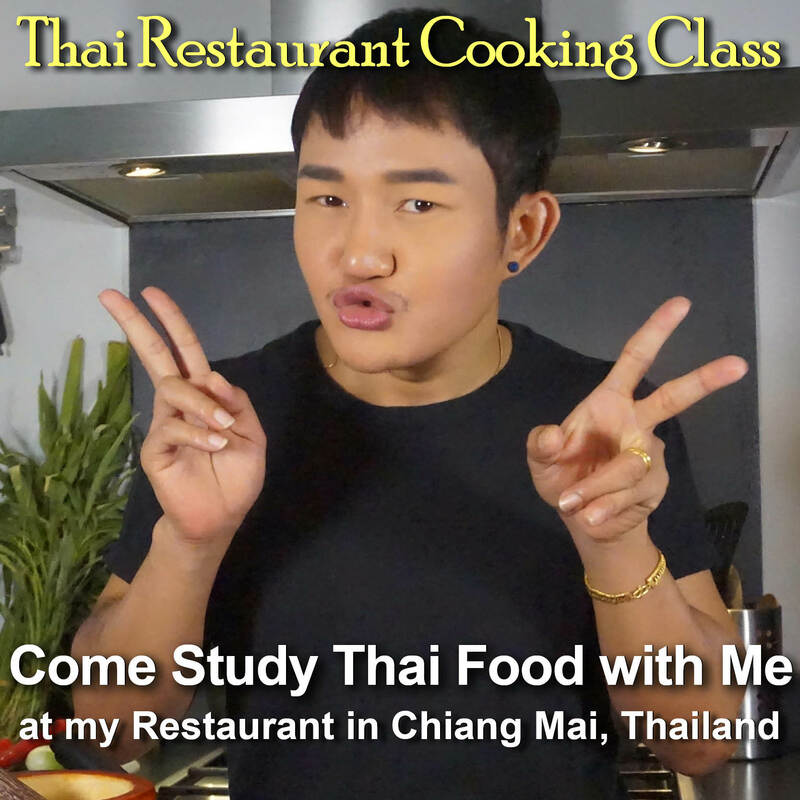 The aroma of Thai sweet basil, the flavor from fresh green pepper corns, and the crunchy goodness of pea eggplants combine to make this a dish that is sure to be among your new favorites. 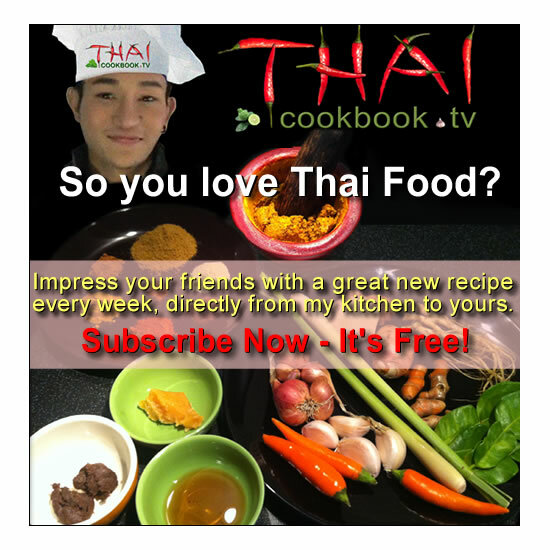 Try Worawut's recipe. It's easy to do at home and we know that you'll love it. 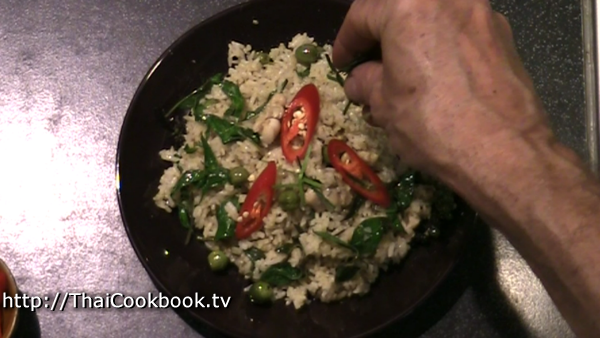 What's in our Fried Rice with Green Curry. How we make our Fried Rice with Green Curry. 1) Earlier in the day, make some white rice so it has time to cool. 2) Remove the bone and skin from a large chicken thigh and cut the meat into 1/2 inch cubes. 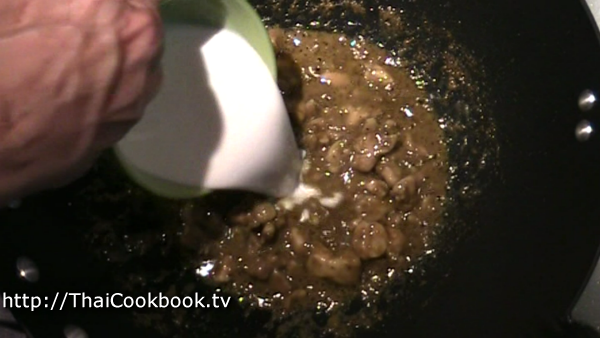 3) Add half of the coconut milk to a cold wok or frying pan. When it starts to get hot, add the green curry paste and stir it in well. 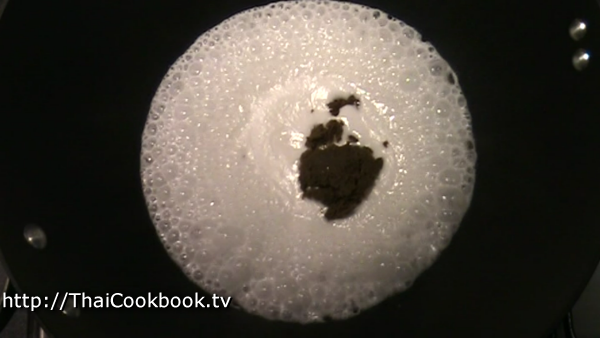 Cook until oils are separated. 4) Add the chicken, stir it into the curry and fry until it is fully cooked. 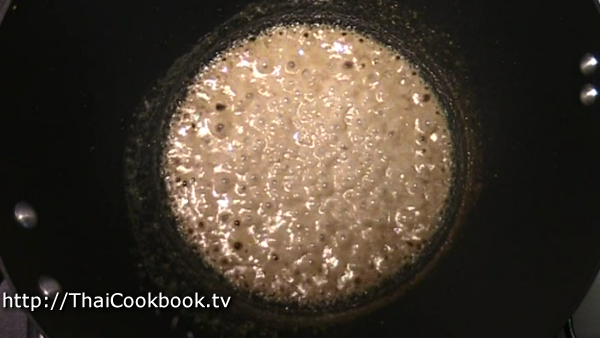 5) Add the coconut sugar and stir it in until it melts in completely, then add the second half of the coconut milk. Stir in well and let the mixture start to bubble again. 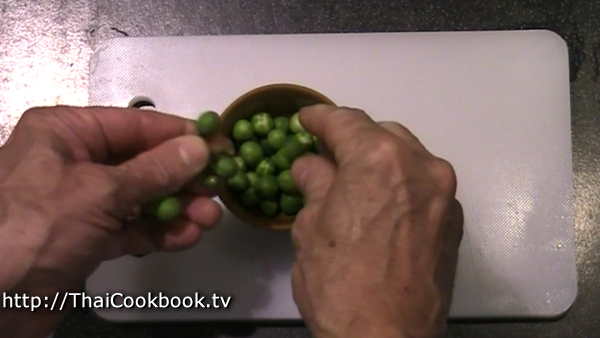 6) Add green peppercorn, kaffir lime leaves, pea eggplants and stir it all well. Let it get hot and cook, slowly bubbling, for about 5 minutes. 7) Turn the heat on as high, then add the rice. Stir it in well and keep flipping it from the bottom. Let it fry and start to get browned a little in some places. Serve hot. We always use the type of basil we call Horapah in any recipe that uses one of our strong chili pastes (curries). Outside of Thailand, this is usually called Thai Sweet Basil or Star of Siam. It has smooth, shiny dark green leaves, purple stems and flower tops, and a distinct fragrance similar to licorice or anise. Be sure you are using this type of basil to obtain an authentic flavor for your Thai green curry dishes. Earlier in the day, make some white rice so it has time to cool. Remove the bone and skin from a large chicken thigh and cut the meat into 1/2 inch cubes. Pluck the leaves and flower tops from the Horapah, enough so you have about 2 cups of leaves. Divide the coconut milk into 2 portions. Pluck the pea eggplants from the stems and clean them well. 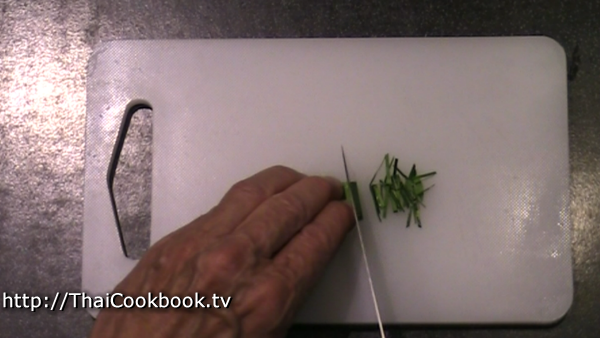 Take 2 or 3 whole kaffir lime leaves, fold them in half, then slice them into very thin strips. These will be used as a garnish, so if you don't have them, no problem. 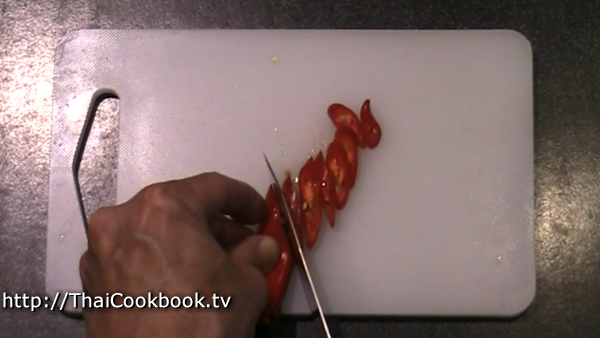 Cut the long sweet pepper into thin slices. This is a garnish, so you can use any type of sweet red pepper. 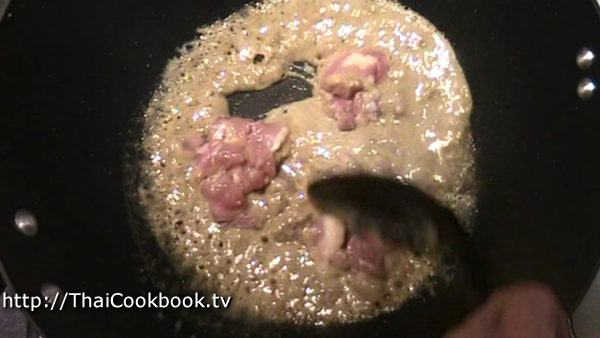 Add half of the coconut milk to a cold wok or frying pan. Turn the heat on medium so it heats up slowly, after the coconut is already in the pan. 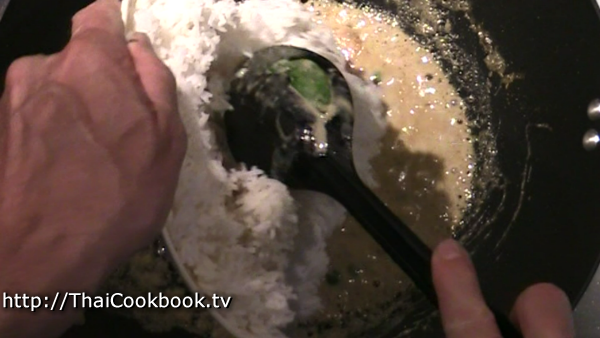 When it starts to get hot, add the green curry paste and stir it in well. Fry the curry and coconut mixture slowly until it thickens and the oils separate from the spices. Avoid letting it get too hot. Cook slowly. Add the chicken, stir it into the curry and fry until it is fully cooked. Add the coconut sugar and stir it in until it melts in completely, then add the second half of the coconut milk. Stir in well and let the mixture start to bubble again. 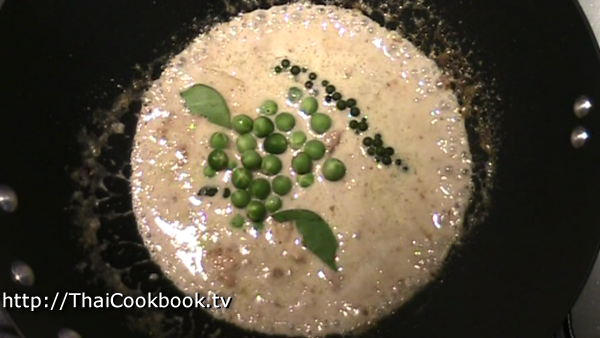 Add the green peppercorn. Tear the center stems out of 1 or 2 kaffir lime leaves and discard, adding the half leaves to the curry. If you don't have fresh kaffir lime leaves, then you can leave them out, no problem. Add the pea eggplants and stir it all well. Let it get hot and cook, slowly bubbling, for about 5 minutes. Avoid letting it get too hot, as the curry can burn and turn brown. Remove the peppercorns and save them to use as a garnish on the side. Turn the heat off, let it cool down a bit, then taste the curry. It will probably be a little salty and spicy like this, but it needs to be strong enough to season all the plain rice. Don't worry. If you think it needs more salt, then you can add some by using the fish sauce. Green curry already has fish sauce in it, so use the additional fish sauce sparingly until you get the flavor you want, and only if needed. Note: Serve prik nam blah at the table so you can season it to taste or add spiciness later. Turn the heat on as high as it will go, let it get hot, then add the rice. Stir it in well and keep flipping it from the bottom. Let it fry and start to get browned a little in some places. 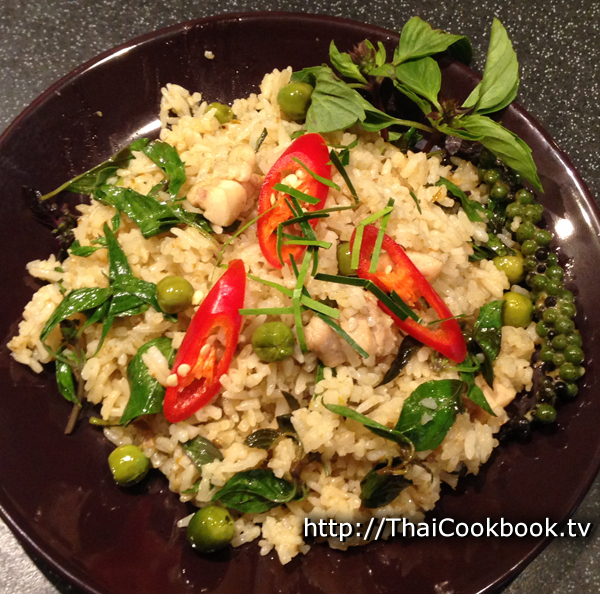 When most of the liquid is absorbed by the rice and the pan is looking dry, turn off the heat and toss in the basil. Mix it up well, then serve immediately on a small plate for individual servings, or on a platter to be shared at the table. Garnish with the green peppercorns on the side, top with some red peppers, slivered kaffir lime leaves, and some fresh Horapah basil.